Soundscape Engineering provides measurement services to assess ground-borne and building structure-borne vibration. We measure vibration generated by transportation, machinery, and people. We evaluate vibration levels to support siting decisions for high-resolution imaging equipment to be located in hospitals and research laboratories. For vibration sensitive laboratory and imaging equipment we can evaluate vibration with respect to the generic NIST and Vibration Criteria (VC) curves and with respect to equipment manufacturers' specific requirements. 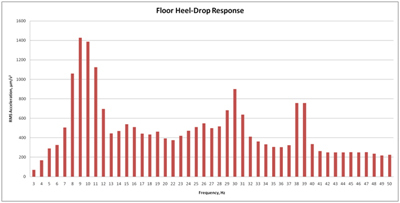 We can perform long term monitoring of vibration induced by construction activities near hospitals, research facilities, and other vibration sensitive buildings and set our monitoring systems to provide automatic notification when preset vibration levels are exceeded. We can also provide long term monitoring of ground-borne vibration caused by blasting and evaluate the levels against U.S. Bureau of Mines criteria.